Background/aim Cataract is one of the major causes of visual impairment globally and the first cause of bilndness. The present study analyzed the impact of caffeine and/or nifedipine in a model of cataract caused by selenite. Materials and methods A total of 75 albino Wistar rats were alienated into five groups (15 each): group I served as control and group II was subcutaneously injected with 30 nmol/g body weight of sodium selenite. Group III received an intraperitoneal injection of 5.15 μmol of caffeine; group IV received 0.1 mg/kg of nifedipine; and group V received the two treatments in the same dose after selenite injection. Groups were decapitated after 5, 15, and 25 days of selenite injection. Comet assay to lens epithelium, refractive index, and ultraviolet absorption spectra for lens proteins were studied. Results The results indicated very high significant increase (P<0.001) in comet assay parameters and refractive index. Also variation of ultraviolet spectra for all groups injected with selenite was observed. Partial recovery was observed after treatment with caffeine or nifedipine but there were no significant differences in groups treated with a combination of caffeine and nifedipine. Conclusion The study stated that to achieve attenuation or delay of lens cataract formation, a calcium channel blocker must be used in addition to antioxidants. Cataract is the main cause of blindness worldwide. Opacification of the crystalline lens occurs by aggregation of cytoplasmic lens proteins due to modifications in intermolecular interactions that are the result of chemical actions including oxidative stress, glycation, proteolysis, transamidation, phosphorylation, and increase of the calcium levels . Theoretically, the conditions that influence these chemical actions like antioxidant reagents would inhibit the attractive forces, being able to delay or to prevent protein aggregation and the opacification. For a better understanding of cataract formation and to help develop a potential therapeutic treatment that could delay or reverse cataractogenesis, models of induction experimental cataract is very important. Selenite which is a strong sulfhydryl oxidant was used as a model for oxidative stress-induced nuclear cataract at a particular age through calpain proteolysis of lens proteins . Caffeine (1, 3, 7-trimethylxanthine) is present in several food and beverage products, such as coffee and tea. It is widely consumed, primarily for its stimulating effect on the central nervous system. Caffeine and other methylxanthines are used in clinical medicine as diuretics, analgesics, and muscle relaxants, and they can aid in the treatment of brain disorders such as headache and Parkinson’s disease . Many articles claim that caffeine protects against cellular damage by producing beneficial antioxidant effects ,,. The increased level of calcium in cataractous lens is due to increased lipid peroxidation which has altered the membrane permeability of the lens and in turn leads to cataract formation. Nifedipine is a highly potent calcium channel blocker (CCB) belonging to the group of 1,4-dihydropyridines that primarily blocks L-type calcium channels with the chemical structure C17H18N2O6. Like other CCBs, nifedipine works by blocking the flow of calcium into the muscle cells surrounding the arteries. It is widely used in the treatment of vascular diseases such as hypertension and angina pectoris. Nifedipine is also used for purposes not listed in this medication guide such as anticataractogenesis  through mechanisms of blockade of L-type Ca2+ channels. The higher doses of nifedipine up to 150 mg/kg did not affect plasma glucose levels, body weight, food and water intakes, blood pressure, and heart rate . The study was designed to evaluate the effect of caffeine, nifedipine, and a combination of them on sodium-induced cataract in albino Wistar rats. All chemicals used in the experiments were obtained from Sigma Company (St. Louis, Missouri, USA) with the highest purity grade available. Sodium selenite was obtained from Fluka (Chemika, Switzerland). A total of 75 healthy albino Wistar rats of both sexes weighing 50±10 g (20 days old) were used in this study. The rats were randomly selected from the animal house facility at the Research Institute of Ophthalmology, Giza, Egypt. They were housed in special designed cages and maintained under constant air flow and illumination during the experimental periods. The rats fed with a balanced diet (protein 21%, starch 70%, fat 3.5%, fiber 3.5%, minerals, and vitamins 2%) and were allowed to drink water ad libitum. The animals were handled according to The Association for Research in Vision and Ophthalmology statements and regulations for the use of animals in research. Group I (Con group): received intraperitoneal injection of saline and served as control..
Group II (Sel group): received single subcutaneous injection of 30 nmol/g body weights sodium selenite to induce cataract . Group III (Sel+Caf): received intraperitoneal injection of 5.15 µmol/day of caffeine starting 2 days prior to the injection of selenite and continuing such treatment till decapitation . Group IV (Sel+Nif): received intraperitoneal injection of 0.1 mg/kg nifedipine starting 2 days prior to the administration of selenite and continuing such treatment till decapitation . Group V (Sel+Caf+Nif): received combined treatments of nifedipine and caffeine in the same regimen. Animals were decapitated after 5, 15, and 25 days of the experiment; the whole eye was removed and placed with the corneal side down on a sterile gauze, and held in place by forceps. Two incisions, at right angles to each other, were made across the surface where the optic nerve enters the eye, and the sclera was pulled back to expose the lens. The orientation of the lens was maintained using the remnants of the pigmented equatorial plane where the iris was attached to the lens. The lens epithelial cells are located on the hemispherical surface oriented toward the cornea which used for comet assay. Lenses without their capsules were weighed and homogenized in a homgenizer (type 7400 Tübingen HO4 manufactured by Edmund Bühler, Bodelshausen, Germany). The homogenate was then centrifuged in a cooling high-speed (type Awel, Chateau Gontier, France) at 16 000 rpm for 20 min and the supernatant was removed in a special sterilized container and used for refractive index measurements and ultraviolet (UV) spectroscopy. Comet assay was done as described by Sasaki et al. . A total of 100 cells were analyzed on each slide. Komet 5 image analysis software developed by Kinetic Imaging Ltd. (Liverpool, UK) linked to a charge-coupled device camera were used to assess the quantitative and qualitative extent of DNA damage in the cells. Tail length (µm) is the distance of DNA migration from the center of the body of the nuclear core and is used to evaluate the extent of DNA damage. The tail moment is defined as the product of the tail length and the fraction of total DNA in the tail. Both the tail length and tail moment were measured automatically using image analysis software. The refractive index for each protein sample was measured using the Zeiss Abbe refractometer attached to a temperature control unit type W Lauda, Germany. The temperature was kept constant at 25±1°C during the measurements. Abbe’s refractometer (W Lauda, Germany) used a particular monochromatic light source; the apparatus is calibrated with water. Samples of soluble lens proteins were diluted to 1 ml with PBS (pH: 8.2). The UV-visible absorption spectrophotometer type Thermos Fisher Scientific evolution 600 UV-Vis spectrophotometer (Modison, WI, USA) was used. The spectra were drawn for all groups in the wavelength range 200–340 nm. Data were presented as the mean±SD. To compare between multiple groups, the analysis of variance, followed by the paired t-test, was used using a commercially available software package (SPSS 11 for windows; SPSS Inc., Chicago, Illinois, USA). The results were considered to be significant at P values of less than 0.05. The comet assay is a simple and low-cost method for the recognition of different types of DNA damage, including single-strand and double-strand breaks, DNA adducts, cross-links, and alkaline-labile sites. [Figure 1] illustrates the comet assay photographs for the control group (Con group), animals decapitated after 5 days of injection with sodium selenite (Sel), and the three groups of animals were treated with caffeine, nifedipine, and both of them (Sel+Caf), (Sel+Nif), and (Sel+Caf+Nif). [Table 1] illustrated the comet parameters for all groups after 5 days of selenite injection compared with their control. As shown, the undamaged cells, the DNA cell image was tightly compressed and maintained the circular disposition of a normal nucleus. Selenite injection lead to a very high significance increase (P<0.001) in all comet parameters compared with the control values. For caffeine or nifedipine groups, the results show a significant increase (P<0.05) in tail length and the percentage of tailed DNA. The results of the tail moment and the percentage of tailed cells have a very high significance increase (P<0.001) compared with the control group. The treatment effect of caffeine and nifedipine is illustrated by the absence of any significanct difference with the control for all comet assay parameters except the tail moment which showed a significant increase (P<0.05). Figure 1 Representative photographs of comet assay of lens epithelial cells for all groups after 5 days of selenite injection. The comet assay image for the control group and all other animal groups decapitated after 15 and 25 days of selenite injection is demonstrated in [Figure 2] and [Figure 3]. The analysis of the image and the calculated comet parameters are illustrated in [Table 2] and [Table 3]. The results indicated that the same phenomena for 5 days is propagated in which a very high significant difference (P<0.001) in all comet assay parameters for the selenite group and the decrease in differences after caffeine or nifedipine injection. Figure 2 Representative photographs of comet assay of lens epithelial cells for all groups after 15 days from selenite injection. Figure 3 Representative photographs of comet assay of lens epithelial cells for all groups after 25 days from selenite injection. [Figure 4] represents the refractive index of the lens crystallin for all the studied groups decapitated after 5, 15, and 25 days. The control group which received only intraperitoneal injection of saline had a refractive index of 1.3323. The refractive index values for all Sel groups showed a very high significant increase (P<0.001) than the control value. Caffeine and nifedipine treatment lead to a decrease in the significant level. The protective effect of administration of caffeine and nifedipine treatment appeared in the Sel+Caf+Nif group that is characterized by approaches of the values of refractive index to the control levels for all periods. Figure 4 The refractive index of the soluble lens proteins in rat lens to all groups after 5, 15, and 25 days of selenite injection. *P<0.001 (very highly significant); **P<0.01 (highly significant); ***P<0.05 (significant). To recognize the mechanism for structural changes of lens-soluble proteins, we examined the secondary structural states of crystallins by UV spectra. 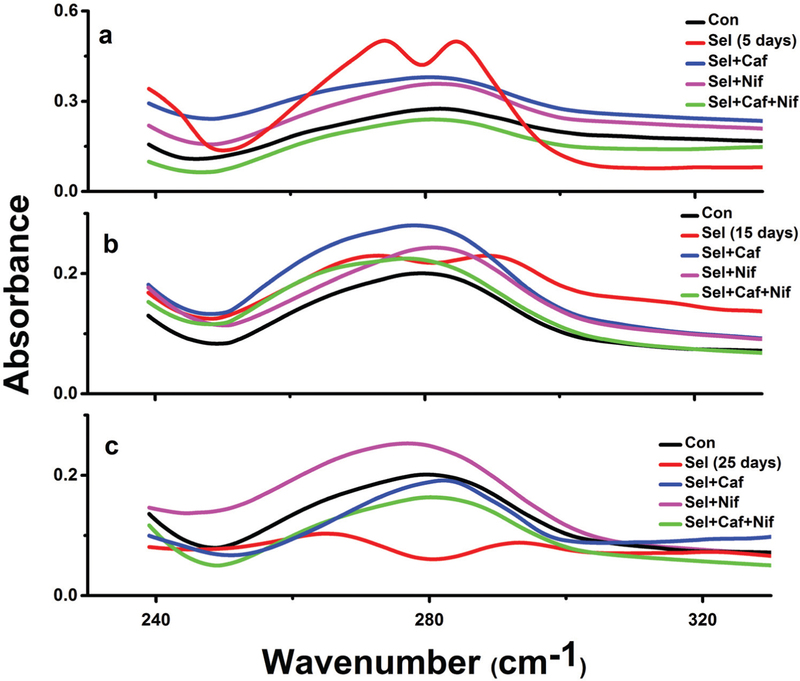 [Figure 5] illustrates the UV spectra for con, Sel, Sel+Caf, Sel+Nif, and Sel+Caf+Nif groups after 5, 15, and 25 days of selenite injection. The control spectra profile reflects the optical absorption of proteins at 280 nm. Also the appearance of the same peak for all treated groups with caffeine and/or nifedipine was observed but with different absorbance. After 5 days of selenite injection, the main peak suffers from splitting and after 15 days a broadening of the peak is observed and then the spectrum loses its protein detection peak after 25 days of injection. Figure 5 Ultraviolet spectra for rat soluble lens proteins to all groups after 5, 15, and 25 days of selenite injection (panel a, b, and c, respectively). In this study, a single subcutaneous injection of 30 nmol/g body weight of sodium selenite was used in an experimental animal cataract model. Selenite-induced opacification of lens may partly copy oxidant exposures commonly present in the atmosphere of a human (e.g. sunlight) and/or occurring in pathophysiological conditions (e.g. diabetes, aging, etc.). By means of the comet assay, the study has elucidated some of the molecular changes subsequent to selenite injection. A variety of geometric parameters are given by the image analysis software, which allows an estimation of the amount of DNA in the head and tail regions, and the extent of migration into the tail region. As the tail length and density reflect the number of single-strand breaks in the DNA, the percentage of DNA in the tail provides a quantitative measure of the damaged DNA. Also, the elevated mean tail moment is indicative of DNA damage that was observed in selenite groups and the degree of the damage was found to increase with the follow-up period. Documented changes in the metabolism of lenticular epithelial cells during selenite cataractogenesis (usually before the appearance of any visible opacity) include inhibition of mitosis and entrance of epithelial cells into prophase, nuclear fragmentation, decreased rate of epithelial cell differentiation , increased damage to DNA , and loss of calcium homeostasis . The power of a lens’ ability to refract light is the prime measure of its functional capacity. In the case of biological lens, its refractive power, which depends on the curvature and refractive index, is linked to the distribution and concentration of its constituent proteins. The functional capacity of the lens to refract is dependent on the relatively unimpeded passage of light through its medium. When the cataract develops and interrupts the transmission of light through the lens, the structure/function relationship between the proteins and the optical properties are altered leading to changes in the refractive index that possibly will indicate early steps of opacification . It has been concluded from our earlier study  that the protein constituents were decreased in selenite cataract in a gradual manner with time and this is the cause of increased refractive index in this study which is directly proportional with time. Another study has shown the same result that the membrane degeneration or fluctuations in protein distribution resulted in local change of refractive index . Spectroscopy permits the investigator to find out more about the optical characteristics and the chemical structure of the protein. As a general role for any protein, the optical absorption is measured at 280 nm. At this wavelength, the absorption of proteins is mainly due to the amino acids tryptophan, tyrosine, and cysteine. The molar absorption coefficient of the protein itself at 280 nm will depend on the relative concentrations of each of these three amino acids. In our study, the normal soluble lens protein spectra showed the main peak at 280 mainly due to tryptophan and tyrosine. The detected changes in spectra due to selenite and the observed broadening with splitting that appeared after 25 days are indicative of cataract formation. This is in agreement with the theory that the cataract is the outcome of conjugated tryptophan and tyrosine . The mode of action of sodium selenite indicated the induction of oxidative stress in combination with a decrease in the activity of antioxidant enzymes in the lens . More precisely, it was hypothesized that the oxidation of critical sulfhydryl groups of proteins of the lens epithelium membranes and the lipid peroxidative damage of lenticular membranes, direct to the inactivation of membrane proteins such as Ca2+ATPase. Hence, the alteration of calcium homeostasis due to the loss of Ca2+ATPase activity leads to the accumulation of Ca2+ in the lens and cataract formation. The protective role of caffeine as an antioxidant is preventing DNA damage appeared in the results of tail moment, refractive index, and UV spectra. The positive mechanisms of action of antioxidants are endorsed to their ability to act as free radical scavengers through the induction of transcription factor nuclear factor erythroid 2-related factor 2-dependent antioxidant enzymes and/or ‘phase II’ metabolic enzymes involved in inhibiting oxidative stress and oxidative DNA damage . Also, it is reported that antioxidants may prevent DNA damage probably through stabilization superoxide dismutase activity and blocks the increase of xanthine oxidase activity following oxidative stress . In addition caffeine is preventing the induction of apoptosis which is a result of DNA damage by controlling the lens metabolism through inhibition of cyclic adenosyl monophosphate phosphodiesterase (cAMP). Caffeine is used with significant success in treating diseases associated with neural and muscular dysfunctions, such as Alzheimer’s and Parkinson’s diseases that their pathogenesis is related to oxidative damage. Thus there is a similarity of these diseases with cataract in the formation of lipid peroxidation products such as malondialdehyde and the presence of DNA degradation products in the neural tissues, similar to that of the lens. Caffeine is acting as an antagonist of adenosine to help overcome the neural transmission defects. Adenosine modulates nerve transmission by binding to the G-protein-linked receptors .CCBs are known to be involved in the repair of membrane phospholipids that are damaged by oxidative insult. They can also inhibit oxidant-induced DNA single-strand breaks . The present study demonstrated that the administration of nifedipine leads to more enhancement. Nifedipine not only block Ca+2 influx into lens cells but also attenuate the oxidative stress and inhibit oxidant-induced DNA single-strand breaks. Also, it has been demonstrated that nifedipine had a potent effect in inhibiting sarcolemmal membrane lipid peroxidation . The selenite-induced cataract model is the most commonly used model to study cataracts, as it partially mimics senile nuclear cataracts in humans, where oxidative stress plays a major role. Caffeine promotes intracellular detoxification by scavenging free radicals and maintaining the antioxidant enzymes. On the other hand, nifedipine, a CCB, slowed the progression of cataractogenesis through blocking Ca+2 influxes into the lens cells and also through attenuating oxidative stress. The damaging effect of selenite injection was completely counteracted by treatment with a combination of caffeine and nifedipine. Tang HZ, Yang LM. Activation of the unfolded protein response in aged human lenses. Mol Med Rep 2015; 12:389–393. Rooban B, Sasikala V, Sahasranamam V, Abraham A. Vitex negundo modulates selenite-induced opacification and cataractogensis in rat pups. Biol Trace Elem Res 2010; 138:282–292. Koblihová E, Lukšan O, Mrázová I. Hepatocyte transplantation attenuates the course of acute liver failure induced by thioacetamide in Lewis rats. Physiol Res 2015; 64:689–700. Sinha RA, Farah BL, Singh BK. Caffeine stimulates hepatic lipid metabolism via autophagy-lysosomal pathway. Hepatology 2014; 59:1366–1380. Kronschläger M, Löfgren S, Yu Z, Talebizadeh N, Varma SD, Söderberg P. Caffeine eye drops protect against UV-B cataract. Exp Eye Res 2013; 113:26–31. El Okda E, Mohamed M, Shaheed E, Abdel-Moemin A. Switching to instant black coffee modulates sodium selenite-induced cataract in rats. Ger Med Sci 2016; 25:14. Kanthan G, Wang J, Rochtchina E, Mitchell P. Use of antihypertensive medications and topical beta-blockers and the long-term incidence of cataract and cataract surgery. Br J Ophthalmol 2009; 93:1210–1214. Kametaka S, Kasahara T, Ueo M, Takenaka M, Saito M, Sakamoto K et al. Effect of nifedipine on severe experimental cataract in diabetic rats. J Pharmacol Sci 2008; 106:651–658. Kyselova Z. Different experimental approaches in modeling cataractogenesis. Interdiscip Toxicol 2010; 3:3–14. Varma SD, Hegde KR, Kovtun S. Inhibition of selenite induced cataract by caffeine. Acta Ophthalmol (Copenh) 2010; 88:e245–e249. Farghaly LM, Ghobashy WA, Shoukry Y, El-Azab MF. Ameliorative effect of acetyl-l-carnitine and/or nifedipine against selenite induced cataractogenesis in young albino rats. Eur J Pharmacol 2014; 729:1–9. Sasaki YF, Nishidate E, Izumiyama F, Matsusaka N, Tsuda S. Simple detection of chemical mutagen by the alkaline single-cell gel electrophoresis (comet) assay in double mouse organs (liver, lung, spleen, kidney, and bone marrow). Mutat Res 1997; 391:215–231. Palsamy P, Bidasee KR, Shinohara T. Selenite cataracts: activation of endoplasmic reticulum stress and loss of Nrf2/Keap1-dependent stress protection. Biochim Biophys Acta 2014; 1842:1794–1805. Bahrami M, Hoshino M, Pierscionek B, Yagi N, Regini J, Uesugi K. Refractive index degeneration in older lenses: a potential functional correlate to structural changes that underlie cataract formation. Exp Eye Res 2015; 140:19–27. Eman MA, Mona ST, Eman SM, Heba AG. Attenuation effect of caffeine and/or nifedipine against selenite induced cataractogenesis. Int J Pharm Technol 2016; 8:12460–12475. Maddala R, Nagendran GT, de Ridder KG, Schey L, Rao PV. L-type calcium channels play a critical role in maintaining lens transparency by regulating phosphorylation of aquaporin-0 and myosin light chain and expression of connexins. PLoS One 2013; 8:e64676. Gakamsky A, Duncan RR, Howarth NM, Dhillon B, Buttenschön KK, Daly DJ, Gakamsky D. Tryptophan and non-tryptophan fluorescence of the eye lens proteins provides diagnostics of cataract at the molecular level. Sci Rep 2017; 7:40375. Makri OE, Ferlemi AV, Lamari FN, Georgakopoulos CD. 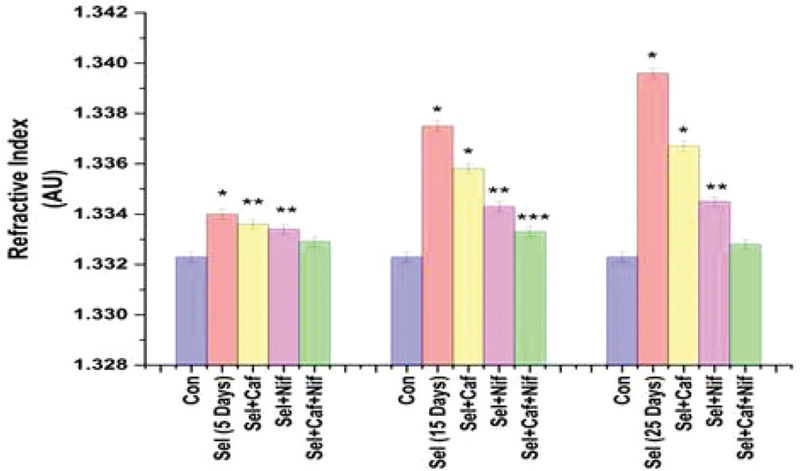 Saffron administration prevents selenite-induced cataractogenesis. Mol Vis 2013; 19:1188–1197. Singh B, Chatterjee A, Ronghe AM, Bhat NK, Bhat HK. Antioxidant mediated up-regulation of OGG1 via NRF2 induction is associated with inhibition of oxidative DNA damage in estrogen-induced breast cancer. BMC Cancer 2013; 13:1–9. Mona GA, Nehad FM, Ahmed MM. Caffeine intake decreases oxidative stress and inflammatory biomarkers in experimental liver diseases induced by thioacetamide: Biochemical and histological study. Int J Immunopathol Pharmacol 2017; 30:23. Varma SD. Effect of coffee (caffeine) against human cataract blindness. Clin Ophthalmol 2016; 10:213–220.